Article written by Mel Cosentino. Seeing animals in their natural environment is full of enjoyment and learning opportunities. Whalewatching, defined by the International Whaling Commission as “any commercial enterprise which provides for the public to see cetaceans in their natural habitat”, is my favourite example. The activity started in the 1950s in the coasts of California observing migrating gray whales from shore. The industry has grown incessantly since, and today over 13 million people go whale and dolphin watching in more than 100 countries around the world. The experience of observing and interacting with a powerful and beautiful animal at sea is enriched when led by a skilled captain and a knowledgeable guide. Moreover, it has the potential to educate the public about the animals as well as to change their attitude towards the environment. Furthermore, the local communities also benefit from the increase in tourists visiting the area. Indeed, the revenues generated by the whalewatching industry is currently over US$2.1 billion in both direct and indirect expenses, much of which ends up in the local communities such as through hospitality and catering as well as other expenses (e.g., souvenirs). Whalewatching is a profitable and sustainable form of cetacean exploitation. However, most cetacean observations are currently boat-based and the increased interest in watching whales and dolphins up close has raised concerns over the sustainability of the activity. In fact, short-term effects have been reported for many cetacean species and populations worldwide, impacting from common and bottlenose dolphins to humpback and sperm whales. These effects include changes in the respiration pattern and dynamics, speed and direction of travel, and changes in activity and energy budgets, such as a reduction in the time spent resting or foraging. Changes in behaviour leading to reduced energy intake (or increased energy use) can negatively affect the energy budget, which in turn can affect the reproductive success of individuals, and, potentially, the survival of the population. Studying the impact of whalewatching is important to the understanding of cetaceans’ behavioural response to disturbance and thus has implications for the management of the activity, both in the study area and beyond. During my undergraduate studies I developed a strong interest in the impact of human activities on cetaceans. 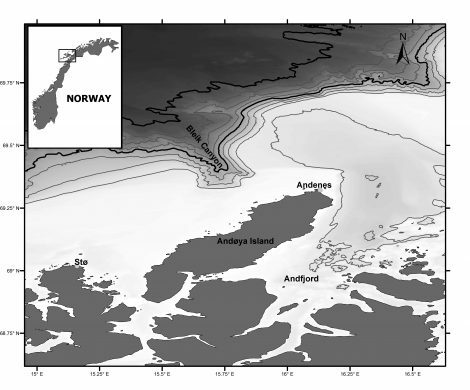 I then gained experience as a whalewatching guide and research assistant during the summer times and later on, for my master’s project, I studied the impact of whale watching vessels on sperm whales in Andenes, in northern Norway (Fig. 1). Mel's study area in northern Norway. 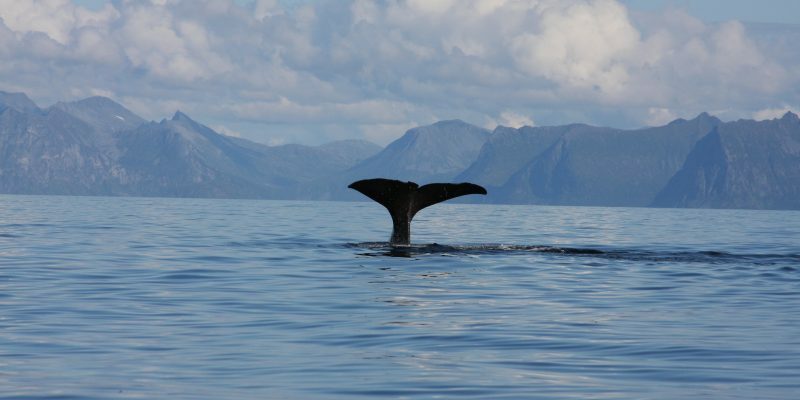 Sperm whales visiting Andenes waters are adult, solitary individuals. They are present every summer season and likely year-round. Some individuals are re-sighted, within and between years, such as Glenn, who was first identified in 1996 and continues to visit the area even to these days. The diving cycle of sperm whales consists of a long, deep foraging dives (~ 30 min) and a resting period at the surface (~ 8 min). Foraging dives start when the whale flukes (Fig. 2) and soon produces clicks that they use to find their prey. The vessel from which I conducted my study has two mounted directional hydrophones which allows to track and approach the whales while they are still underwater. I monitored the duration of the foraging dives and surface periods, as well as the respiration pattern and dynamics, and the occurrence of “near surface events” (NSE – previously known as “shallow dives”). NSE are easily recognised, as the whale does not fluke and simply disappears. These NSE are short underwater periods (~ 2 min) that do not involve foraging (i.e., the whales are not clicking) and appear to interrupt resting and normal oxygen intake. They also appear to entail an unnecessary increase in energy expenditure, especially when accompanied by an avoidance behaviour (i.e., moving away). These NSE hadn’t been studied before. I found that that neither the foraging dive or surface periods, nor the respiration pattern and dynamics were directly affected by the presence of whalewatching vessels. However, sperm whales were almost seven times more likely to perform a NSE in the presence of whalewatching vessels, and when these occur, the surface time increased a 75% (6 min), which was also associated with changes in the respiration pattern and dynamics. It is unknown whether the observed associated behavioural responses are due to NSEs, or if NSEs are a consequence of disturbing a whale that is already distressed. As the sperm whale plunges back into the depth, it flukes up high. The results also suggested that sperm whales might need time to recover from a NSE before engaging in a new foraging dive. Interestingly, the duration of the foraging dive was independent of water depth or the previous surface period (i.e., duration and presence of whalewatching vessels). This means that the occurrence of NSE led to an increase in surface time that was not followed by longer foraging dives. Sperm whales have a low cost of living, low diet quality, and one of the highest diving efficiencies for a diving animal. Their foraging strategies are related to their specific energetic requirements and the behaviour of their prey; therefore, performing longer dives might not be worth the effort. This means that the additional time spent at the surface represents time that will no longer be available for other activities, such as foraging or resting. The risk-disturbance hypothesis argues that animals perceive human disturbance in a similar manner to nonlethal predation risk, and thus an animal’s response should follow the same economic principles as if encountering a predator, as observed, for example, in elk and birds. Sperm whales do not seem to follow this principle, exhibiting various acoustic and behavioural reactions (and sometimes no reaction at all) to natural and anthropogenic underwater sounds, to the presence of whalewatching platforms and to killer whale presence/sounds (i.e., predators) and attacks. Also, it appears that sperm whales may react less to the presence of tour vessels than other cetacean species, with recent studies only reporting changes in the inter-breath intervals. This low level of response has also been reported for sperm whales in other areas, such as off Kaikoura, in New Zealand and off the Azores in Portugal. However, the level of exposure should also be considered. In Andenes, under the current level of exposure, the observed short-term effects likely have no biological consequences for the individuals. However, larger number of whalewatching vessels could increase the exposure levels and some individuals may be targeted several times a day by more than one whalewatching vessel, likely increasing the occurrence of the observed short-term effects and potentially leading to long-term consequences. Near surface events are an easy to identify indicator of likely disturbance, and thus they should be included in regulations or protocols for whalewatching targeting sperm whales. Individuals that show signs of disturbance should be avoided, minimizing or preventing the adverse consequences of cumulative effects. The use of hydrophones as well as increased collaboration between companies, especially with the use of land-based stations to detect whales, can help avoid vessels targeting the same individual. Understanding the occurrence of NSE may well help explain, and avoid, the circumstances under which obvious and subtle responses occur in the presence of whalewatching vessels or other potential stressors. The International Ecotourism Society defines ecotourism as “Responsible travel to natural areas that conserves the environment and improves the well-being of local people.” (TIES, 1990). Ecotourism is wildlife tourism, such as whalewatching, that minimises human impact, while building environmental and cultural awareness, providing financial benefits for conservation. Whalewatching trips are offered in almost every country where cetaceans (including river dolphins) are present. In the era of internet and social media, it is easy for you to find information in advance about the company you plan to use to provide you with an experience of a lifetime. Many countries have developed or adopted whalewatching guidelines and best practices (also see IWC) to minimise the impact of the activity. These provide recommendations on the behaviour of the vessels around the animals as well as the number of boats that can be targeting a given animal or group of animals at the same time. Do not hesitate to ask your guide or captain to show you the guidelines they follow and how they apply and comply with them. Your satisfaction depends on it, and remember that the trip has to be good for you and for the animals too! As a matter of fact, your satisfaction will not be the result of how close you are to the animals but of the overall experience around wild animals. Each trip is different, and as we interrupt their natural behaviour when we approach them, they will not always be willing to interact with us. A good guide and a responsible captain are key for an exceptional experience, both for you and the animals. And how much better if you can learn about the whales’ biology, behaviour, and conservation concerns, as well as about area while helping local communities? Be an ecotourist! Held by the Luxembourg Maritime Cluster on 28 May 2019. An online platform to monitor illegally caught aquatic mammals. The end of a 4-week internship with the NDP. Third week at the Namibian Dolphin Project by Jaz Henry. Week 2 at the Namibian Dolphin Project for Jaz Henry. First week at the Namibian Dolphin Project by Jaz Henry. On the search for two endangered coral species in Panama. Read about our Science Festival activity about plastic pollution. An introduction to harbour porpoise research. An update on the VaquitaCPR project.